Congratulations to the winners of the last contest. S.J. Bolton's Awakening will go to Dorothy D. from Troy, IL. The Baker Street Letters by Michael Robertson goes to Robert M. from Thomasville, NC. The books will go out in the mail tomorrow. This week, I'm giving away the first three books in Margaret Grace's Miniature Mystery series. All three books are autographed. And, check out the gorgeous covers. I know two out of the three were done by Ben Perini. Thank you to Margaret (Camille Minichino) for donating the books for this contest. 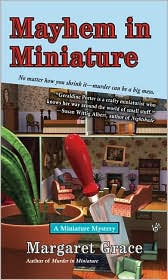 As I said in my July 16 review, Murder in Miniature introduces the series, and Geraldine Porter. She's a retired widow, devoted to her granddaughter, who is visiting in this book. The family relationships are very special in this series, and cozy readers will appreciate Geraldine and her family. Geraldine's role as chairwoman of the local Dollhouse and Miniatures Fair puts her in the proper place to observe some unusual behavior amongst friends before two people are murdered. Or you could enter to win Mayhem in Miniature. Wouldn't you think a retiree would have enough on her hands creating a miniature Victorian room box for the holiday auction, teaching crafts at a retirement home, and watching her visiting granddaughter? No. Gerry Porter has to add a murder investigation on top of her everyday duties. It's a perfect way to bond with a granddaughter! 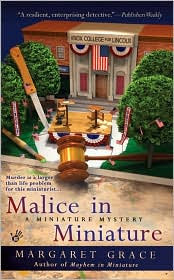 Malice in Miniature reunites Gerry with her beloved granddaughter, Maddie, when her son's family comes to visit. 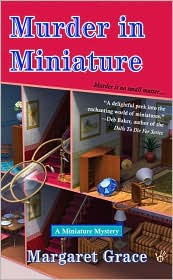 But, it wouldn't be a Miniatures Mystery if Maddie and Gerry didn't get caught up in a murder while completing a miniature room box. Which Miniatures Mystery would you like to win? You can enter to win all three, but I need three separate entries for that. If you'd like to win one, email me at Email me!. If that link doesn't work for you, the email address is: lholstine@yahoo.com. Your subject line should read either Win "Murder" or Win "Mayhem" or Win "Malice". Your message should include your mailing address. Entrants only in the U.S., please. The contest will end Thursday, August 6 at 6 p.m. PT. Jim will draw the winners at that time. The winners will be notified, and the books will go out in the mail on Friday. Good luck! How nice of you to do this, Lesa! And ... I didn't know who did my covers. Imagine that! Once you have the winners, I'd be happy to offer bookmarks and pens to all those who entered and did not win. Best wishes to all .. Your covers are gorgeous! I've been mentioning that lately on my blog when the covers seem to jump out and grab you. I have to admit, Berkley Prime Crime uses some wonderful cover artists.